For similar compilations, see Final Fantasy I-II and Final Fantasy I & II: Dawn of Souls. 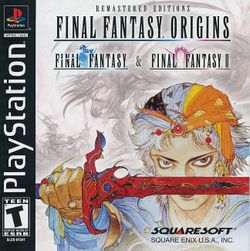 Released well after the PlayStation 2, Final Fantasy Origins was the third and final collection of Final Fantasy games to be ported to the PlayStation. At that point, all Final Fantasy games except Final Fantasy III were available on the PS1. It would also be the first time that Final Fantasy II was released in the US. The games contained enhanced graphics as well as a couple of FMV cutscenes. In a move that was both hated and loved by the fans, an "easy mode" was included, which reduced the strength of enemies, increased your party's strength, and reduced the amount of experience needed to gain levels. They also contained the "quick save" feature of the other compilations, allowing players to save anywhere. Several years prior to Origins, a remake of the two games was done for the WonderSwan Color, however as the system was never released outside of Japan, the games were never localized. Origins is an enhanced version of these remakes. Despite the numerous changes from the original, all of the important things - dungeon layouts, monster locations, characters, etc. are exactly the same. No dungeons have been added, removed, or modified. Classes are exactly the same with none added or any attempt made to balance them (this would come with Dawn of Souls). In the end, it's still Final Fantasy, just prettier and with a lot of annoyances removed. Please see their specific guides for walkthroughs and information. Graphics and audio have been updated and are on par with SNES games. Numerous bugs have been fixed so spells actually work and equipment that was supposed to be strong against certain species and elements actually are. A new FMV sequence has been included, replacing an in-game sequence. HP losses/gains are now displayed next to the character, rather than in text boxes below the action. Various music pieces have been replaced with new tracks. Remodelled menus with controller shortcuts have been added. The game can be saved anywhere, not just on the world map. (This is only a temporary save to the PS1's RAM, you have to go to an inn/use an item to permanently save to a memory card). You can save up to fifteen different games per memory card. Expanded dialog to help explain and enhance the plot. Full names are now used (so "Cure 4" instead of "Cur4", "Excalibur" instead of "Xcalbur", and so on). More accurate names (no more Wizards that can't use magic), and items/equipment/monsters that are based on mythology have the actual name. Modernized naming conventions ("Dispel" instead of "Xfer"). Equipment is now stored in the common item menu, rather than each character holding equipment even if they are not using it. This means you can hold more equipment and any character can use any equipment as an item if it is unequipped. Beating the mini-game earns you 10,000 Gil. Items can now be bought and sold in bulk, rather than one at a time. Stores are also actual rooms, rather than just the dialog screen. The grave in Elfheim now belongs to Link from The Legend of Zelda instead of Erdrick from the Dragon Warrior series. Alas, Garland will no longer threaten to knock you down. Are irrelevant to the gameplay (graphics, audio, expanded dialog, FMVs, etc). The only thing that can't be changed is the pooled items. That said, Origins is a bit easier than the original due to the bug fixes. Most of the bugs in the NES version worked against you, so you are a tad bit stronger. Like Final Fantasy I, an FMV sequence has been added, the graphics and audio are updated, your party can run, and your character will auto retarget. Combat is more balanced: Your accuracy is much higher and status ailments are far less effective. Unique music for each boss replaces the generic boss music. Aside from the graphical update, various sprites have been redesigned. The maximum number of items is now 63 (it was 32 in the original). Icons denote items, equipment, and spells. This page was last edited on 5 October 2012, at 04:21. This page has been accessed 45,859 times.